Ryan Phillips—the executive editor of the Starkville Daily News and a part-time instructor at Mississippi State University—was apparently triggered by MSU Young Americans for Freedom and their recent activism project. MSU YAF was, like dozens of chapters across the country, holding a tabling event to drive discussion on border security and President Trump’s proposal for a border wall to stem the flow of illegal immigrants. Thank you for assuming that I’m a white male! You’re welcome to come to the table next time and not base your opinion off of one video on twitter. You made an ignorant judgement without speaking with a single representative for the group, in fact not 1 single member said they were against LEGAL immigration, and you decided to slander us without any concern for truth. Phillips did offer the YAF student activists an interview, but it seems rather clear that objective or even truthful reportage would not be the result. “Having a dialogue is important,” he says after referring to YAFers as members of the KKK. Good one. Evidently in the throes of a Trump Derangement Syndrome attack, Phillips also forgets that President Clinton ordered the construction of border wall and President Obama oversaw the construction and upgrading of even more border barriers. This episode is emblematic of a major problem within higher education—and to an extent within the larger culture today—where ideological opponents of conservatism turn to ad hominem attacks and poison the well of ideas in their attempts to silence conservatives. Rather than checking his deeply flawed and inaccurate perceptions of YAF, Phillips called them out for being the KKK. Then when students pushed back, he offered an interview in an attempt to seem reasonable. Perhaps worse, Phillips is teaching journalism ethics to the rising generation at MSU, highlighting another problem Young America’s Foundation sees all-too-often: bias in the classroom. Exposed through YAF’s annual Comedy & Tragedy Report, the leftist slant of professors and courses does no favors to students. One-sided and unchallenged, the “education” delivered by the likes of Phillips turn students into lemmings who are unable to defend the ideas they’ve been force-fed for years, and the resulting intellectual weakness is crippling. It is this sorry state of education that makes Young America’s Foundation and our Young Americans for Freedom chapters so necessary today. Without bold conservatives such as those in MSU YAF, important and open discussion on the critical issues of our time would not happen. 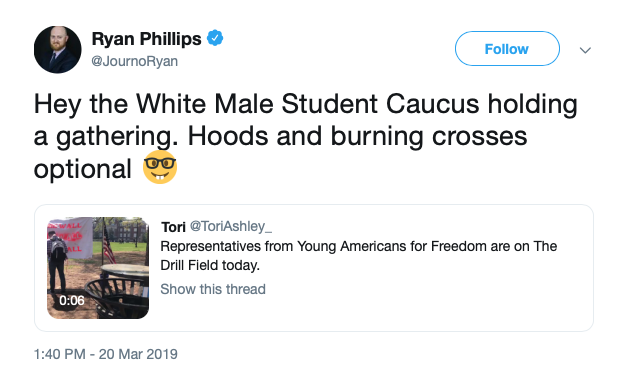 Phillips owes MSU YAF an apology along with those who’ve been afflicted by the hatred of racist intolerance—drawing false comparisons cheapens the horror wrought by the KKK’s despicable worldview. Young Americans for Freedom’s founding document—The Sharon Statement—declares unequivocally that “foremost among the transcendent values is the individual’s use of his God-given free will, whence derives his right to be free from the restrictions of arbitrary force.” From its start in 1960, YAF has given no room or credence to any thought that one man’s life is any more or less valuable than another’s.